we love to honor and celebrate our amazing young artists! 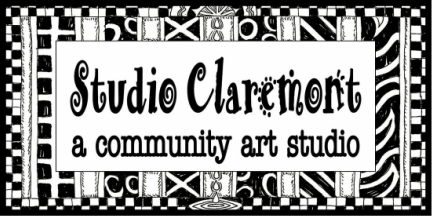 art installations for our front window and student gallery. 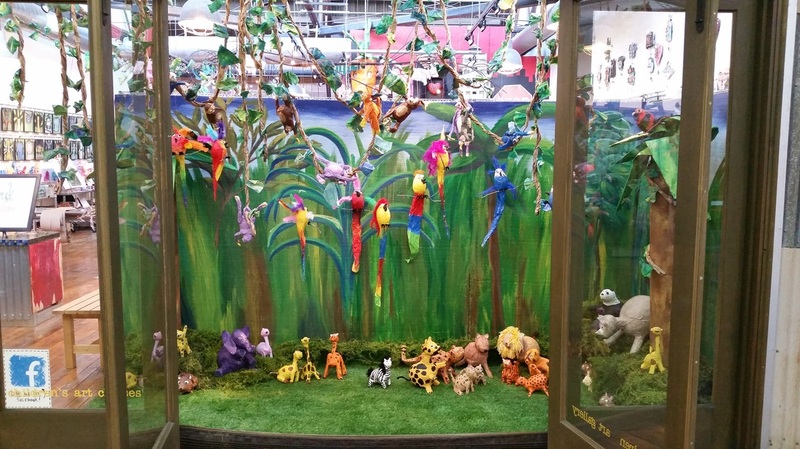 Each of our talented artists created a paper machine animal to dance in this front window display. We made accessories with pipe cleaners, beads, wire, and tie dye coffee filter clothes to complete the look. Our students got the choice of creating a tie dye vest, poncho, or skirt. 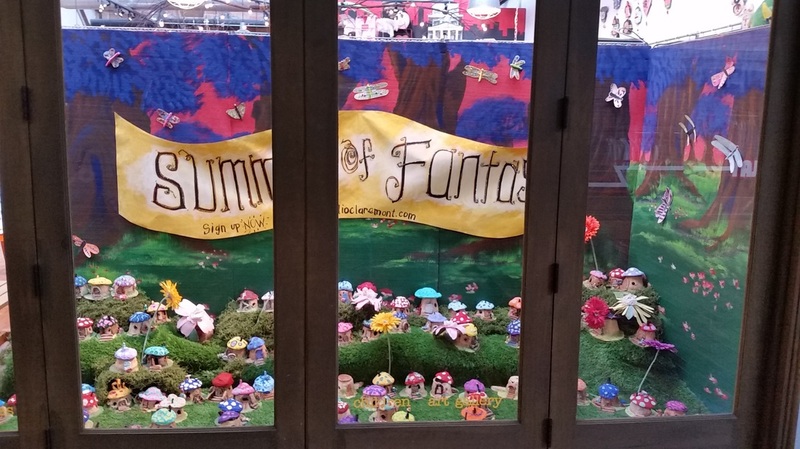 This window was a BLAST to create! 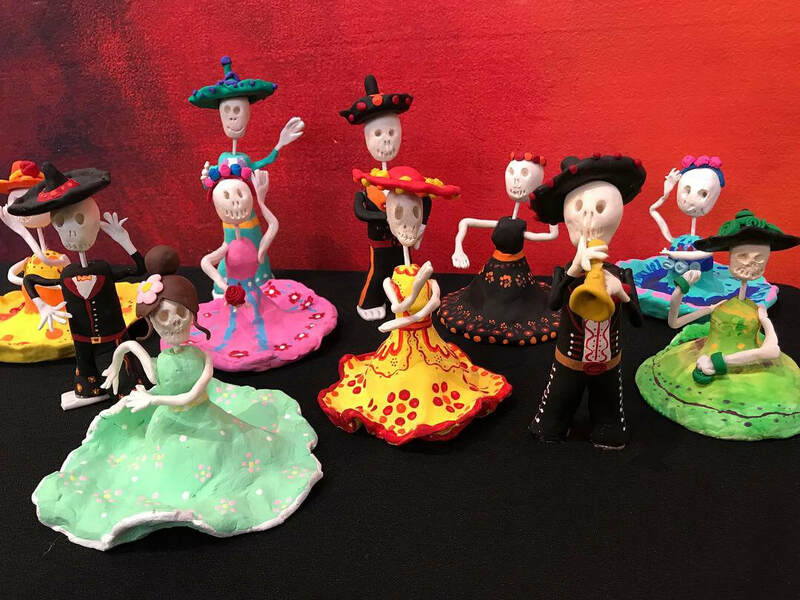 We celebrated Dia de los Muertos 2018 by sculpting fun and coloful skeleton dancers. Each ceramic dancer is complete with sculpy clay details and painted with acrylic paints. 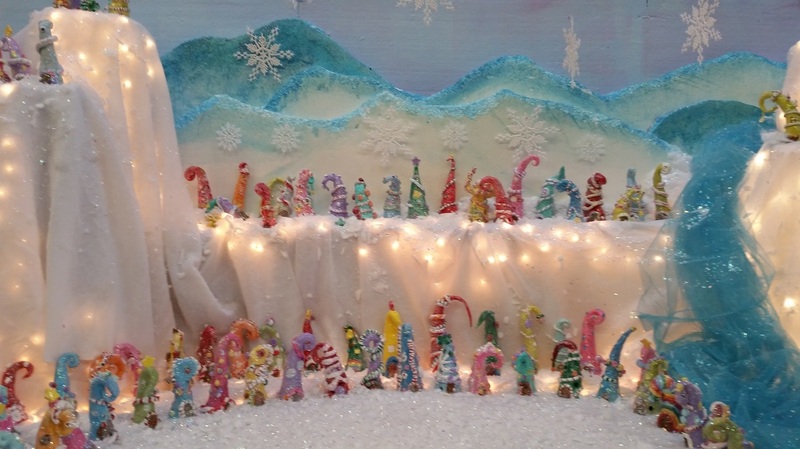 Paper Cakes Bakery was a yummy window display! As good as these sweet treats look, they are all made out of paper mache and clay. ​We used acyrlic paint, foam pieces created to be fruits, dyed rice as sprinkles, and runny paint as chocolate and strawberry drizzle... YUM! Our artists created paper mache jungle animals out of recycled materials. We used newspaper, foil, and water bottles to create this fun and eco-friendly window display! 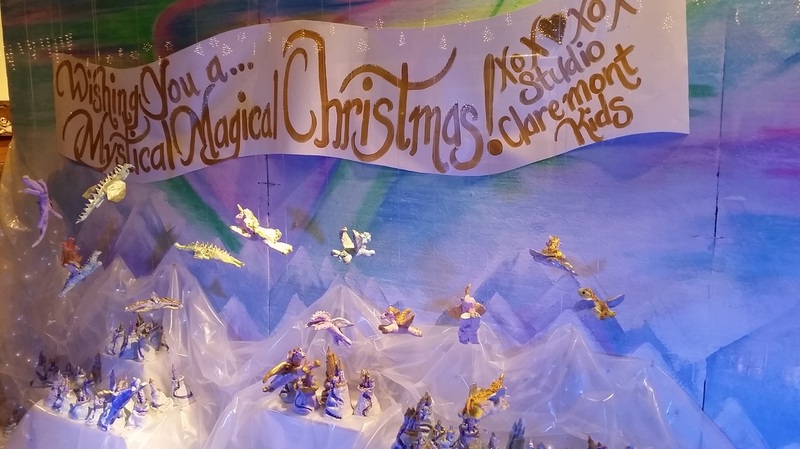 All our young artists sculpted mystical creatures for this icy art installation. 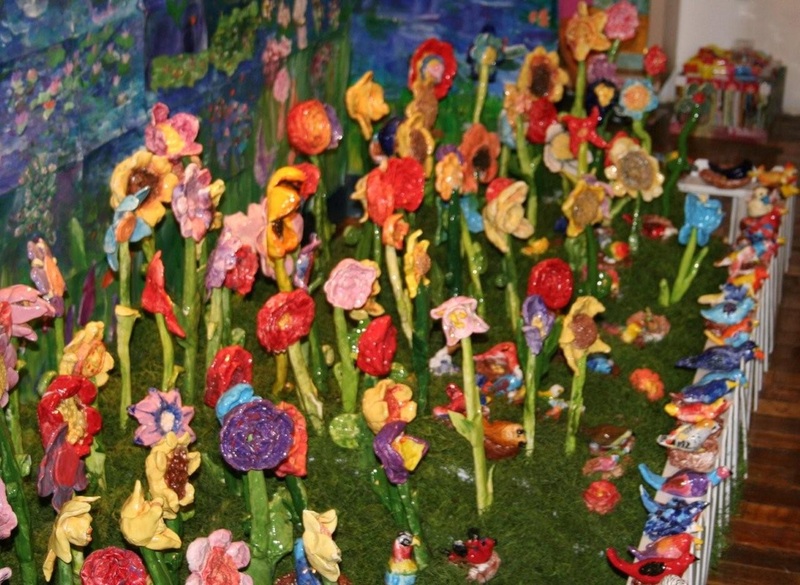 Unicorns, pegasus and dragons were sculpted from clay then painted with soft colors and metallic paint. Small clay ice castles add to the the frozen landscape. 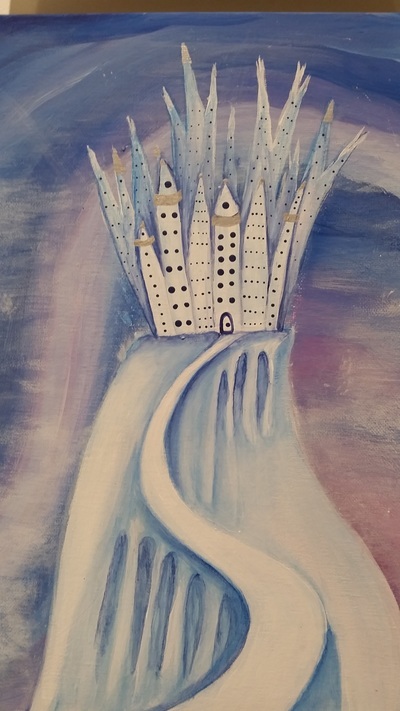 We also did ice castle paintings in acrylic paint. I guess we were inspired by Frozen fever. 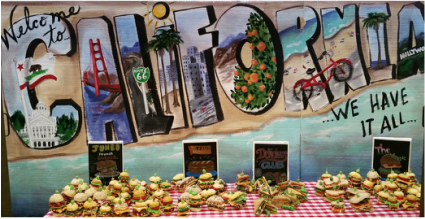 We made these cute burger cupcakes with white cake mix, sesame seeds, ginger snaps, green colored coconut and sugar cookie fries. YUM!!! Kids LOVED them! 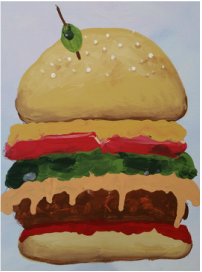 Yummy burger paintings filled the walls! 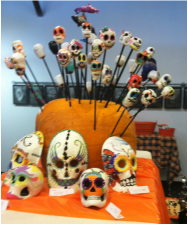 We love Halloween and Dia de los Muertos and this one combined them both! Each student sculpted their own skeleton and then wired it together so it could dance and move! 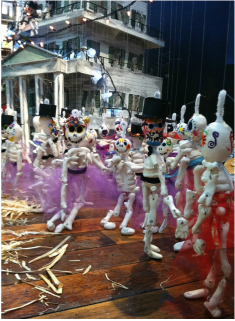 Their heads were painted in Dia de los Muertos style. 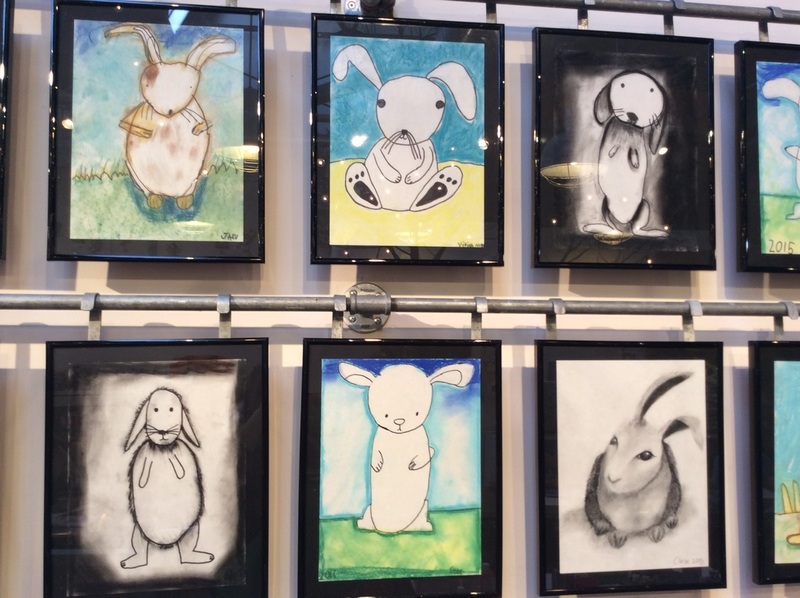 We had an ART Show with this one. 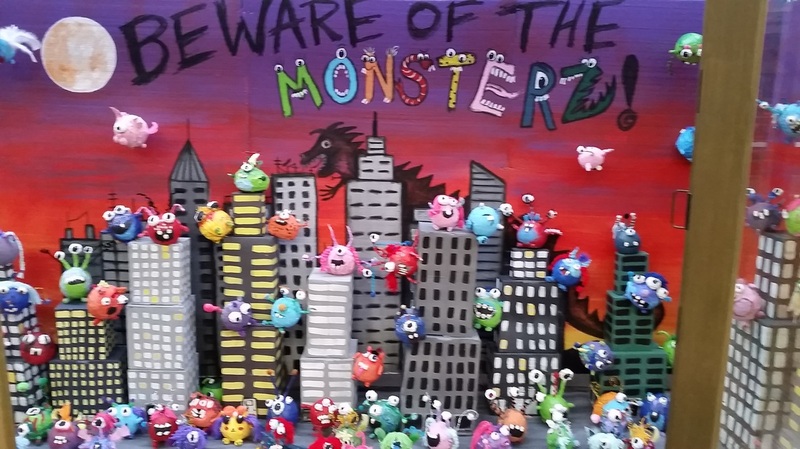 Check out the cool centerpiece our young artists created for the ART Show below. Well since it doesn't rain in California very often, we thought we'd take matters into our own hands and create our own rain of sorts. 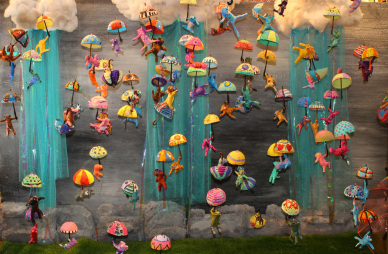 So paper mache colorful cats and dogs with little umbrellas fell from the sky. SO FUN!!! A Charles Dickens Christmas Carol inspired this one. 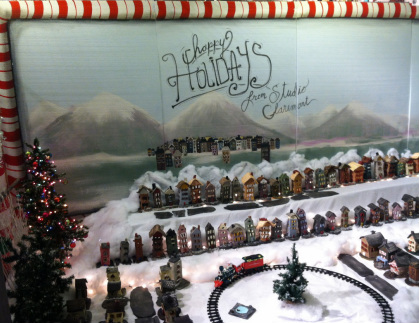 All the houses are sculpted and painted by our young artists. The best part is we could light them UP!!! 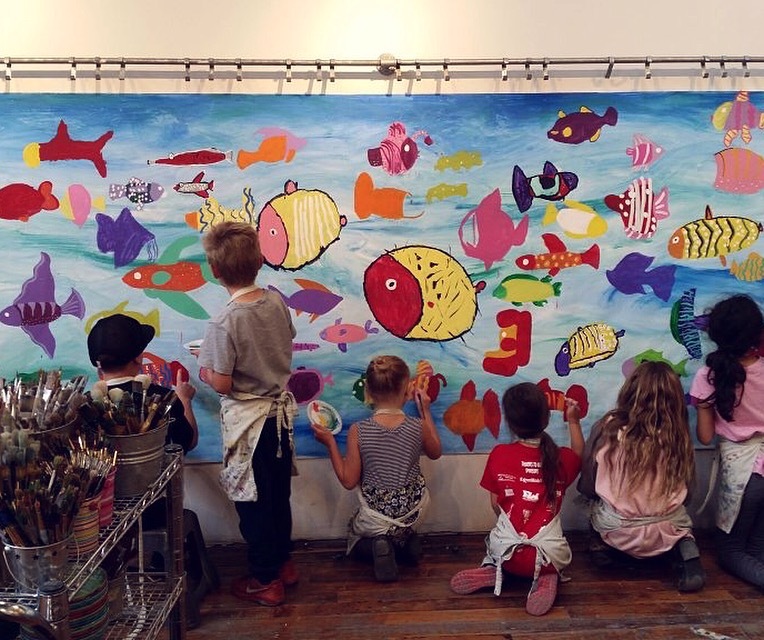 We filled the walls with our young artist's Nutcrackers from around the world. 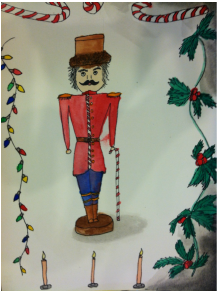 All Nutcracker paintings were done in watercolor and watercolor pencil. This one was SUPER CUTE!!! Each young artist created their own self portrait trick or treater out of clay and Paperclay and then made a costume for it. They were all attending a masquerade ball in the grand ball room. 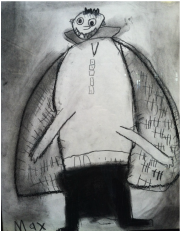 All artists also created a charcoal drawing of themselves wearing their favorite costume. They all came out amazing! 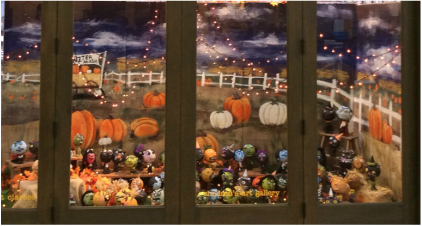 Then, as always we had a Halloween art show complete with haunted house. TOO MUCH FUN!!! 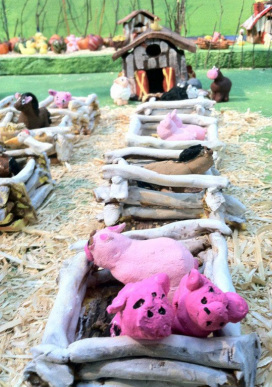 Pigs, cows, chickens, ducks, horses even dogs and cats were all sculpted by our young artists for this down on the farm art installation. 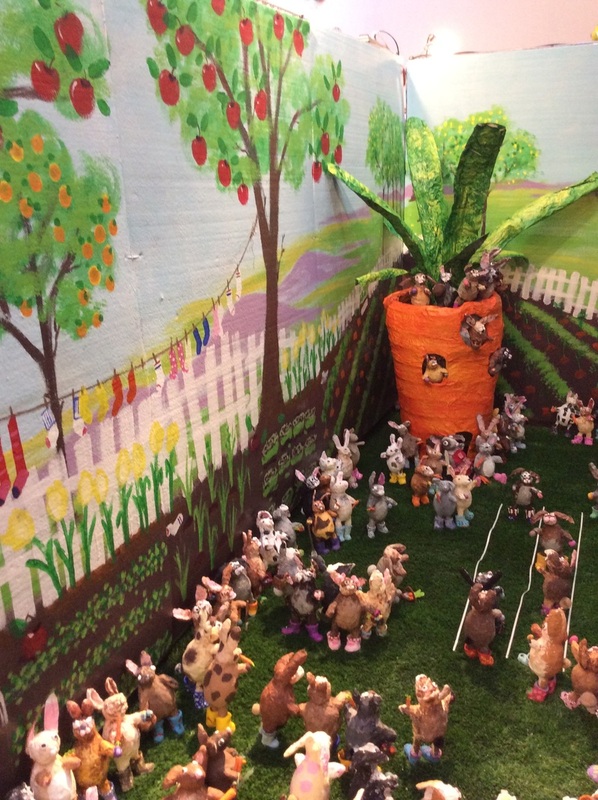 They even made clay barns! 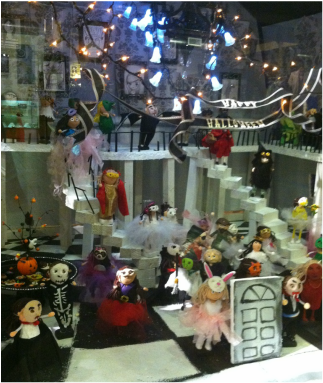 These are some of the paper mache ghouls for our 2014 Halloween window. Their heads are paper mache, feet and bodies are fired clay and their facial details are created from Paperclay. We painted them with 3-4 layers of paint and A LOT OF LOVE! 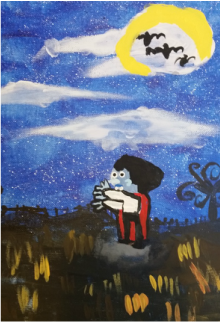 All our young artists did a portrait of their paper mache ghoul and created the moody and spooky environment for the background. In honor of the Winter Olympics, all classes sculpted winter animals, penguins, artic fox, moose, deer, polar bears and then made a flag of their favorite country. GO TEAM GO!!! Our young artist's also did watercolor snow scenes to fill our gallery walls. BRRR!!!! 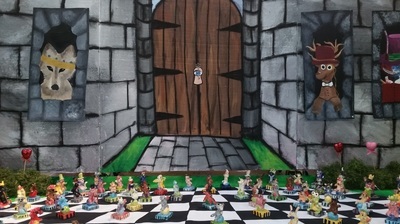 This one is really hard to see but all students created their favorite fairy tale character out of paper mache and then they escaped from our Fantasyland Giant Storybook. 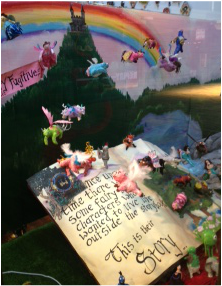 The kids really loved creating their favorite storybook character. This was a fun theme with a lot of geography. All students created a suitcase and their own designed travel stickers. 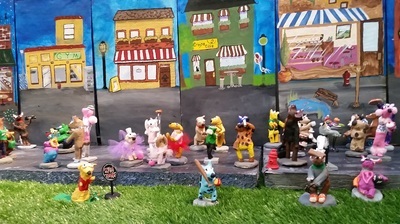 They also sculpted famous landmarks like, the Great Wall of China, the Golden Gate Bridge, the Leaning Tower of Pisa, the Coliseum, The Eiffel Tower, Lombard Street, Big Ben and their favorite mode of transportation, boat, scooter, double decker bus. The lanterns were made in honor of the city of love, Paris. 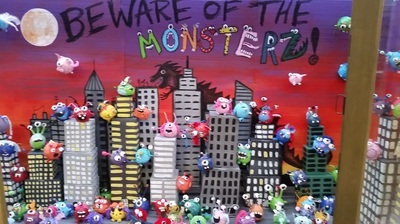 This is one of our very favorite themes! 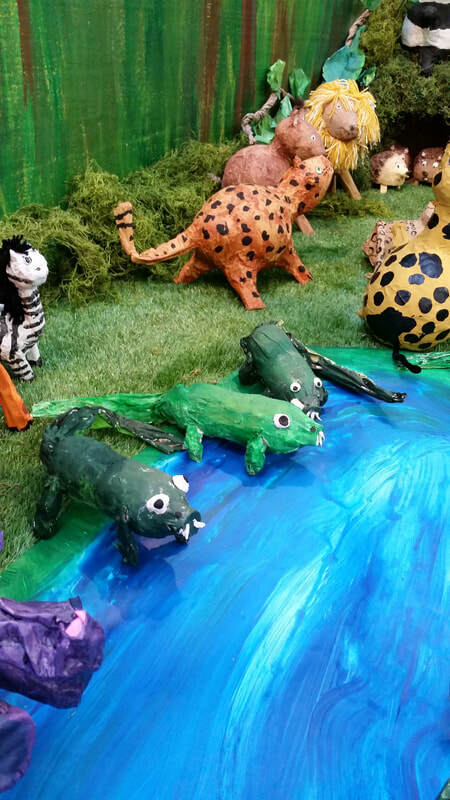 Our artist's created paper mache colorful dinosaurs, some liked to climb and other's loved the swamp! Thankfully all omnivores, herbivores and carnivores got along just fine. Ahh, the relaxing palette of colors that Impressionism creates! 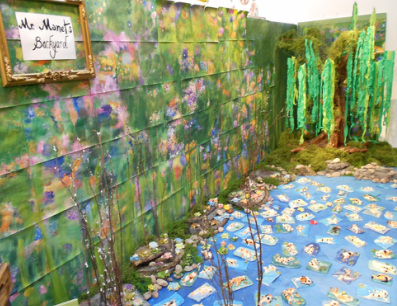 Our young artists created an impressionist mural that was pieced together. The ground was made into a pond and then they each sculpted a koi fish to swim in its peaceful water. Colonel Culpepper's Haunted Mansion was inspired by the Haunted House at Disneyland. 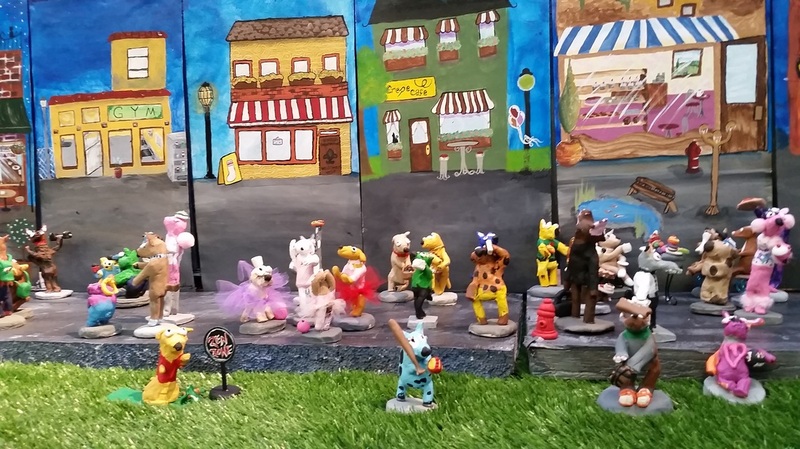 These little trick or treaters were created out of Sculpey clay. The trees were sculpted out of clay and spooky faces were added. Fun and silly tombstones were also added. We also painted spooky paintings for the student gallery. Then we had our Halloween ART Show and haunted house. 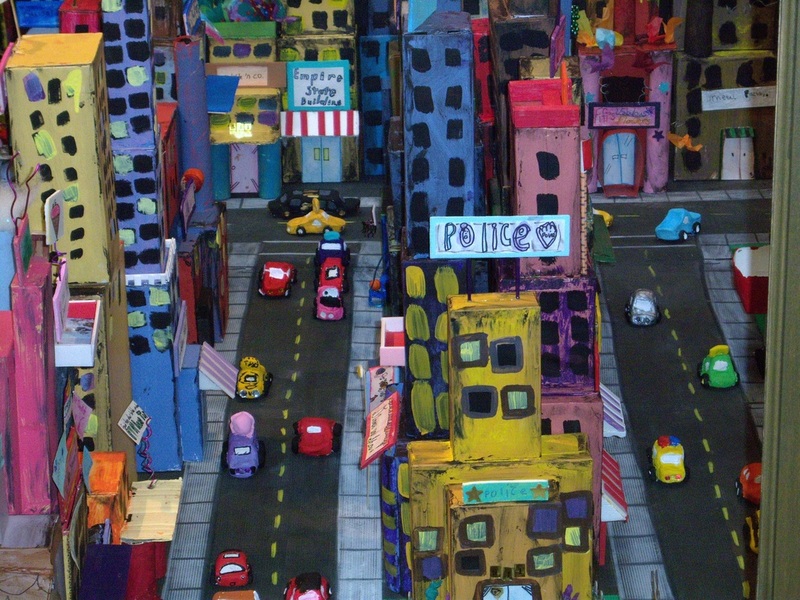 Petropolis was a city our young artists created out of recycled boxes and tubes. They added cars, taxis, scooter and dogs of course. This one was so big, it took up two large areas! 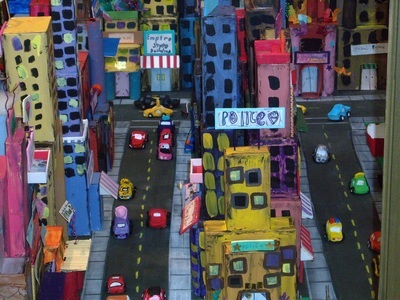 It was really hard to keep little ones out of this city, it looked like so much fun to play in! 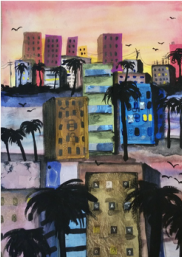 Egypt has so much history and art, it's hard to cover it all. Each young artist created an egyptian sculpture like the Sphinx, a pyramid container, and a plaque with their name written in hieroglyphics. Our young artists loved creating death masks out of paper mache. We could have even added more to this one but ran out of time. 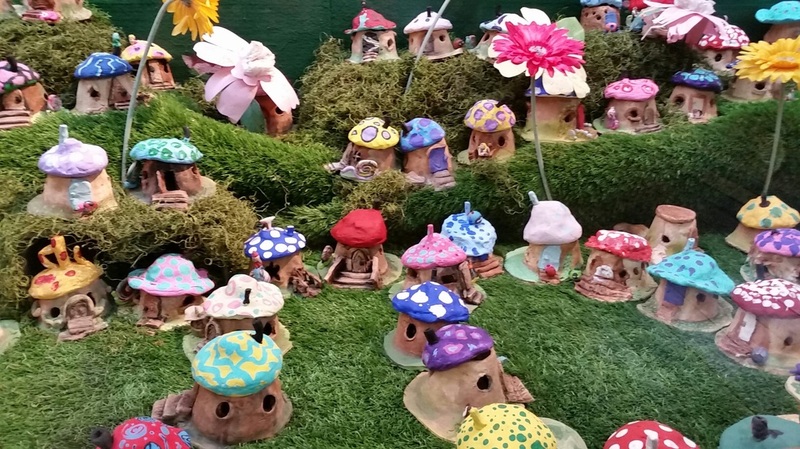 The gARTen party flowers and birds were all sculpted from clay. 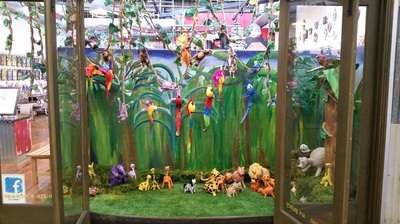 It made for such a nice spring time window art installation. 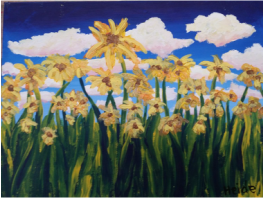 We also did flower paintings of all kinds to really make the gallery bloom! 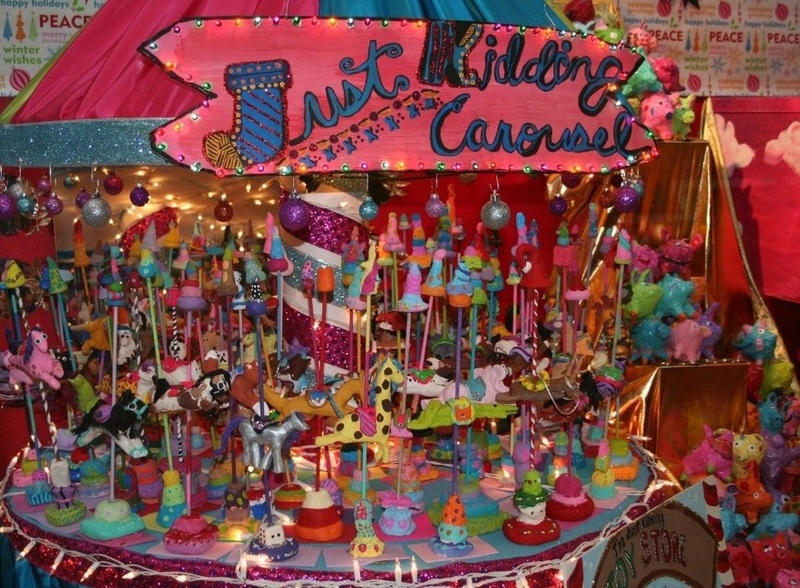 For Christmas of 2009, the Just Kidding Carousel was created by our young artists. 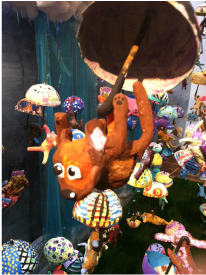 Each animal on the carousel was sculpted out of clay and then put on a post to be added to the carousel. 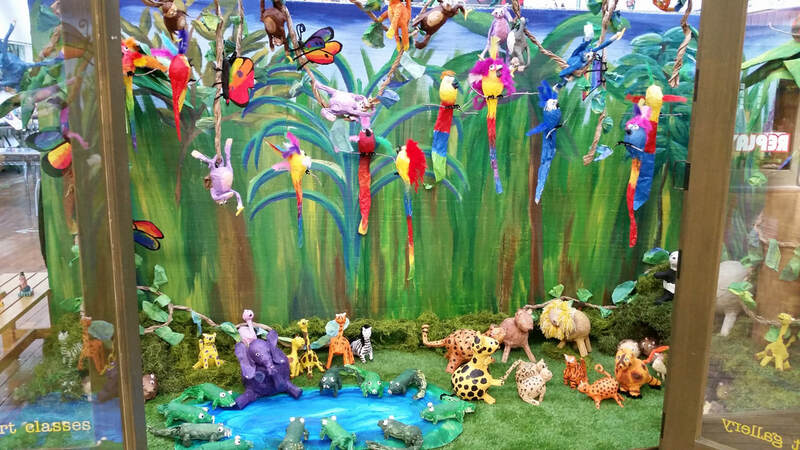 Paper mache animals watched the carousel go around. 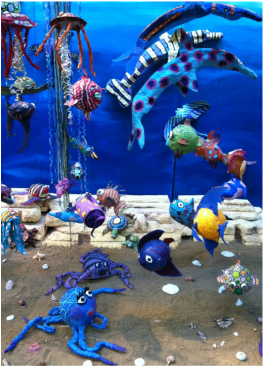 Under the Sea was our first art installation for our window. 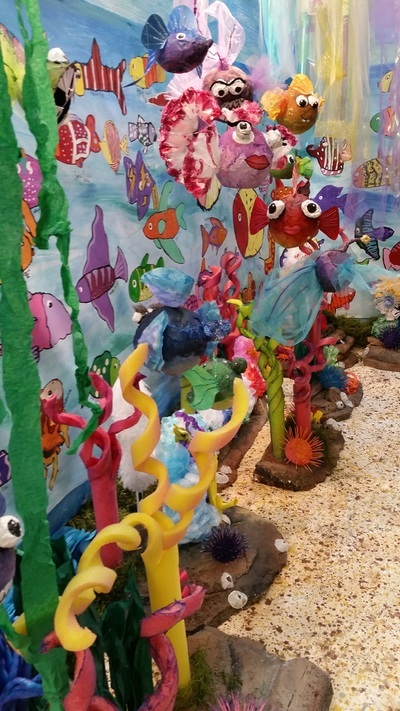 Our young artists created all the sea life out of paper mache and paint. 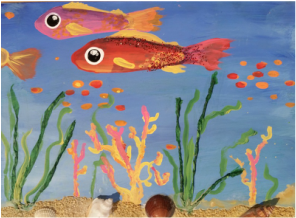 There was an emphasis on design as they painted these amazing sea creatures! 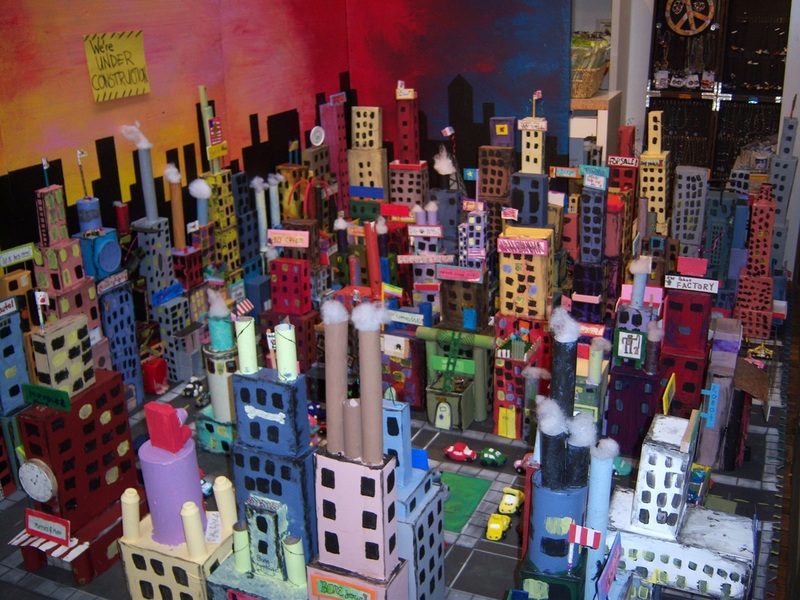 We also did city scapes using the elements and principles of design. Fiesta de los Muertos honored Dia de los Muertos one of our favorite holidays. This little village was sculpted by our young artists. All the houses light up and the skeletons dance in the streets. 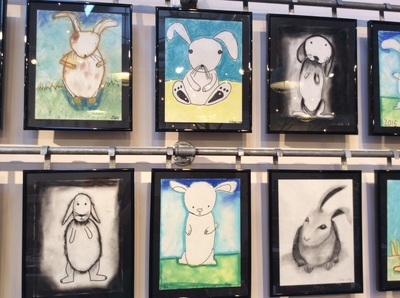 Of course, we had to have an ART show. 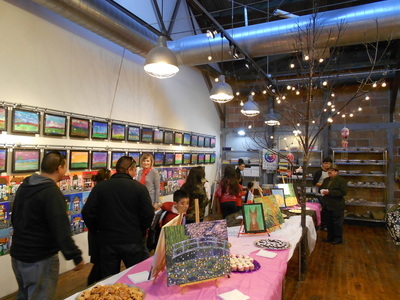 Valentine's Day is a great time to have an ART Show. The Sweetheart Bakery was created by our young artists all out of clay and sculpey. 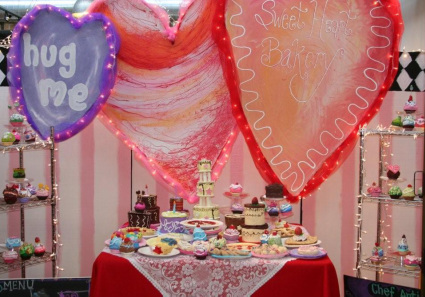 All the items looked so real, many people wondered if we were a bakery! 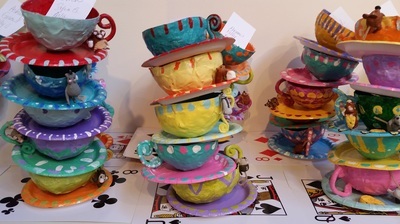 We also did ice cream, cupcake, pie and cake super sweet paintings for the walls! Delicious and Zero calories!!! ​We had a fun a SweetheART Show too! Lots of YUMMY treats and GREAT ART! 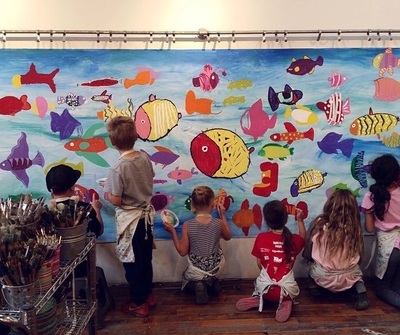 Fish paintings of all kinds were created for the student gallery.